At a time in England when loyalty to Scripture placed Christians in the center of the nation's wars, Gurnall was more concerned with the souls of his people than the issues of conflicting political parties. Compiled from his many sermons on "the saints' war against the devil," his exhaustive exposition of Ephesians 6:10-20 treats the spiritual battles of believers and their God-given protection. Originally written in three volumes (1655-1662), the book first covers the Christian's call to arms and describes the nature of the battle and the character of our enemy. 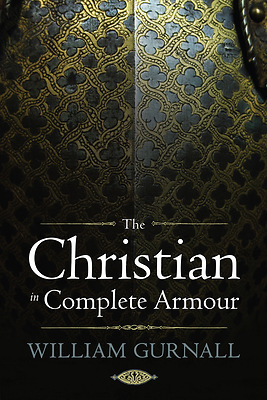 The various pieces of godly armor and weapons, and their use on offense and defense, are then described at length, item by item and verse by verse. More pastoral and practical than theological, Gurnall's work is filled with spiritual insight, encouraging exhortation, and inspiring word pictures concerning the importance of doctrinal truth as "a girdle for the mind," the power of holiness, the "pre-eminence of faith against other graces," and much more. Profoundly biblical and as relevant today as it was almost 350 years ago, Gurnall's work is a resource that will add grace to the library of Calvinist and Arminian alike. This edition includes an introduction and biography of Gurnall by J.C. Ryle.